Today, Bali, Prambanan, Malang and few other places in Indonesia are very festive. Thousands of giant effigies (ogoh-ogoh) are being taken around the city for pengrupukan. Later tonight, the giant effigies, which symbolized bad energy, will be burnt. Most of people in the world celebrate New Year with boozes, trumpets and parties, but devout Hindu Dharma in Indonesia celebrate it in different way. They disconnect themselves from the world, meditate, reflect and observe the four principles of Nyepi: amati geni, amati karya, amati lelungan and amati lelanguan. Amati geni means to refrain from lighting fire and using light. This mean complete darkness and no food will be served as one will not be able to cook. Those who are willing and able, could observe 24 hour fast, while those who are unable to, usually prepare food from few days before. Besides fasting, mona brata or to refrain from speaking is also observed (I love mona brata!). The second principle, amati karya means to refrain from doing any activities; the activity that suggested is sitting still and mediate. Again, this is not mandatory and only for those who are able. Amati lelungan means to refrain from going out of the house and travel should also be observed. In Bali, one will not be able to leave premise unless there is an emergency such as illness or childbirth. The last principle is amati lelanguan, to refrain from any kind of pleasure, including meceki, the traditional card games. Sadly, many people play meceki, which most of the time involve money, during Nyepi. I experienced my first Nyepi in Bali couple years ago. It was my first and I shall hope not my last Nyepi. Nyepi in Bali, is different from Nyepi in other city, because the whole island is completely quiet and dark. ATMs and convenience stores are covered with dark plastic, people fly out of Bali and those who couldn’t leave Bali, buy a lot of food. When Nyepi starts, at 6 in the morning, the only thing that I head was birds chirping beautifully. During the evening, I heard nothing but the barks of the dog across the house where I stayed. The roads were deserted because people were staying at home; only pecalang, the traditional Balinese police, seen patrol around the area. The night, for me, was the most memorable. It was a new moon and the sky was completely dark; so dark that I wasn’t able to gaze the stars. The last couple year, Bali and Nyepi has proven tolerance. Last year (or maybe a year before), Nyepi observed on Friday. 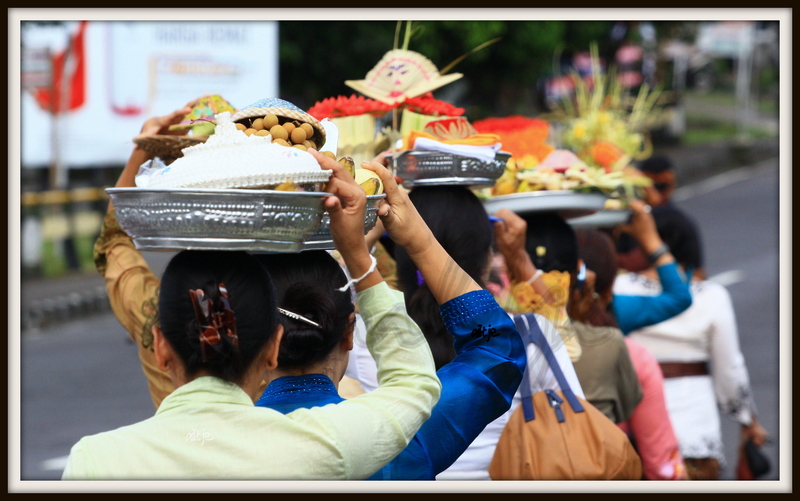 Moslems who live in Bali observed they pray but at the same time still respect the Nyepi. The call for praying at the mosque was not performed using the speaker. This year, Nyepi falls during Lenten and once again, Bali and its people will show their tolerance. If only the whole world could learn tolerance from Bali, the world might be a better place. To all the devout Hindu Dharma in Indonesia and abroad, Rahajeng Nyanggra Rahina Nyepi Çaka 1937. May we are all bless with peace in mind, peace on earth and eternal peace.